We are excited to announce the newest program by Jay Baer! Our best-selling author and renowned keynote speaker on marketing and customer service has created Talk Triggers: Turn Your Customers Into Volunteer Marketers. Customer experience is how you make your customers feel. Great customer experience occurs when you exceed customer expectations. And when you do so, customers are COMPELLED to talk about you. In this fast-paced, timely, dynamic presentation, Jay teaches his customer experience excellence framework, showcasing how any business can turn customers into advocates. Using customer service, operational excellence, and small (yet memorable) differentiators, Jay’s customer experience formula is in use all over the world. With hilarious and poignant storytelling, Jay teaches attendees the three primary ways to use customer experience to trigger word-of-mouth, illustrates mistakes to avoid, and inspires audiences to put new strategies into practice immediately. 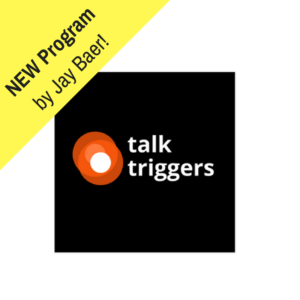 Talk Triggers is a visceral, memorable program, and Jay has delivered it worldwide to B2B, B2C, government, small business, and corporate audiences. For booking information on Jay Baer, contact Michelle Joyce or visit MichelleJoyceSpeakers.com. Tune in every Friday for additional featured speakers!